Hmm, I seem to have acquired an out-of-gauge wagon ...! It is from KBScale, previously the Roy C Link range of industrial narrow gauge products in 0-14. Each time I walked past the KBScale stand at EXPO-NG I found it harder to resist, and ended up picking up a trial set of wagon and a length of track. This is the same kit that Phil Parker described on his blog a little while back. The truth is that I have long admired the Roy Link range, I dusted off my Industrial Narrow Gauge Manual and found the invoice for it tucked inside ... from 1995! But 0-14 is very much a specialist scale, there is nothing ready-to-run, not even track, although KBScale make some track parts. As someone who has never made my own track (although I did make up some quarry track in 009 once, it was never operational), and uses commercial chassis, this would seem and odd choice of scale. But there is something appealing about tiny industrial trains, skip wagons, internal combustion locos that look like they were made in a shed (and often were), a very purposeful and no-frills approach to railways. And while Nigel Lawton has shown that these can be modelled in 009, since I am clearly no watch-maker, and part of the point of modelling such an industrial railway is including the detail, to me 0-14 is the obvious scale. With my little boy's 4th birthday coming up we thought it would be nice to get him a train set; a Hornbly Thomas set has been obtained from the bay of e's. However it won't last long being laid on the floor, nor is it likely to get played with often if it is a lot of trouble to set up. Really the track needs to be laid on a board which can be got out when required, but we have no where to store a large enough board. The hinges are of the paste-table type from a local hardware store, attached to uprights in the corners of the board, other uprights act as stops. The outer edge of the board is faced in 5mm foamed PVC, which was free from the marketing department at work, offcuts of advertising boards! This fascia reinforces the hinges and stops. The pictures should make it clear. The last picture shows what could be fitted onto the board. The train set came with (surprisingly) 3rd radius curves, a second radius oval can be fitted inside. 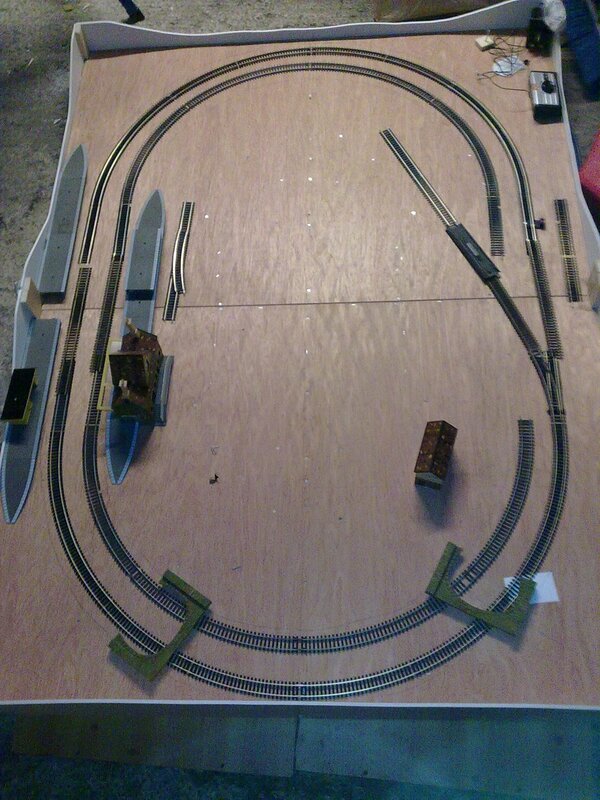 The outer oval is positioned to allow a platform to fit on the outside on one side of the board, with a siding outside the oval on the other, obviously plenty of space inside for sidings. There is space for a short straight between the end curve and a length of flexi-track over the board joint, a 6' long board would allow a double-straight (or two points) either side of the joint but that would be too big to fit under the bed. At one end the fascia is raised to allow for a tunnel.